As many human livelihoods are closely connected with the marine environment, we need to respect the ocean and its inhabitants in order to ensure this relationship continues for future generations. Overfishing and associated by-catch, noise pollution, coral bleaching due to climate change and pollution caused by plastics and other marine debris are severe threats our oceans have to face these days, with all of them having anthropogenic causes (human-made). The consequences of mismanagement and exploitation are not limited to the marine life, but impact directly on human populations who rely on healthy marine ecosystems. Marine wildlife tourism is one way to reconnect with the ocean and its animals, which has become a need for people, particularly those from urban areas. Media have widely influenced the public understanding of wildlife and nature in general. However, this source of information comes with a twist, as media representation of wildlife tourism in documentaries or images portraying wildlife and people in social media may also give false, idealised impressions of the wildlife experience. 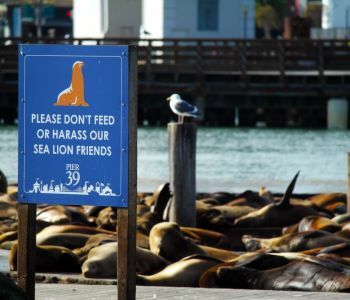 Harassment and disturbance of individuals and groups of animals is now a common issue in wildlife tourism, resulting in negative responses from the species being viewed and consequent reductions in tourists’ safety. An integral part of sustainable wildlife-watching activities are operators who act in a responsible way. In the future, it is planned to introduce the most influential people in this business here on the website – so keep yourself posted! This website has a strong emphasis on the promotion of responsible interactions with marine wildlife. We want to help by providing information on guidelines/codes of conduct as well as general “do’s & don’ts” when getting close to marine life. I believe, as scientists dealing with this subject, we have to do our bit to contribute to education and awareness-raising within our fields of research, so that people and, especially, the marine fauna, can benefit from the work we are dedicated to.